alaTest has collected and analyzed 290 reviews of Canon XF100. The average rating for this product is 4.5/5, compared to an average rating of 4.1/5 for other Camcorders for all reviews. People are impressed by the design and size. The price and portability also get good opinions, whereas some have doubts about the viewfinder. We analyzed user and expert ratings, product age and more factors. Compared to other Camcorders the Canon XF100 is awarded an overall alaScore™ of 88/100 = Very good quality. The Canon XF100 is a very capable camcorder that is easy to handle. This professional camcorder has a ton of features that you can use to record high quality high definition videos. 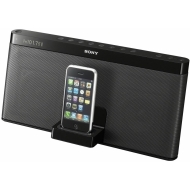 The Sony RDP-XF100iP iPod Speaker is Sony's latest premium iPod/iPhone docking device and features a removable lithium-ion battery for portability. We check to see if it has the lungs to match. The Sony RDP-XF100iP delivers impressively powerful sound given its portable size; comes with a useful remote control and FM radio. In spite of its portability, the hefty, minimal design doesn't lend itself to active outdoor use. The concave buttons on the top are difficult to distinguish. The Sony RDP-XF100iP is a versatile, powerful iPod/iPhone speaker for around the home that surprises with its deep low-end sound. The sound easly fills up a room and can be heard throughout my 1200 sqft home. I think sound quality is very good too. Greatest Ipod dock radio EVER! No more outlets NEEDED I'm FREE!! The iphone dock is amazing! I bought this for the house and for outside at the pool and it is amazing!!! I can't believe the carry we get outside, very happy with this product!